Root Canal Therapy or Extraction? Which one is better? These are common questions from patients who rush into our clinic with severe toothache. I am Dr. Ellie an emergency dentist in Brisbane and in this article I try to explain the two options for dealing with a badly infected tooth. There are four major tissues that make up the human tooth. Enamel is the hardest tissue of the tooth. In fact it is the hardest part in the human body. The softest part of the tooth is in the centre of the tooth and contains blood vessels, nerves and other tissues. 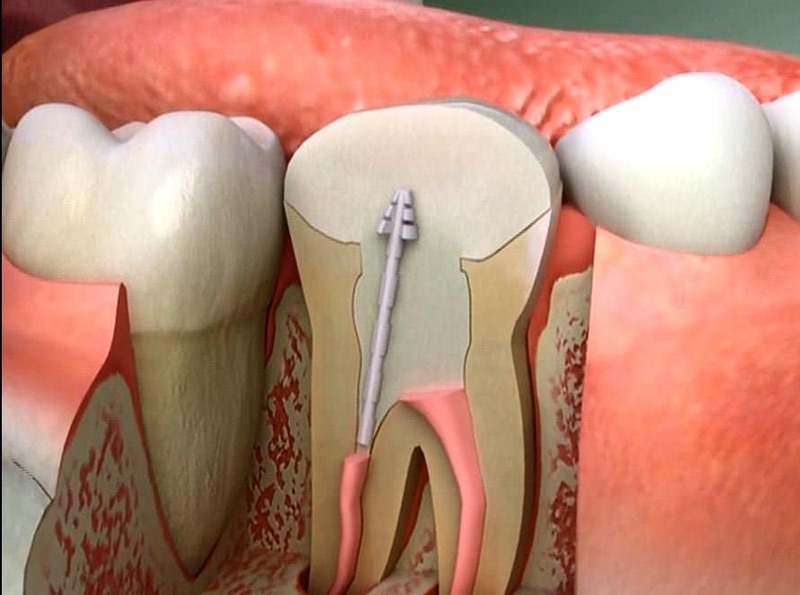 The soft tissue extends to the root of the tooth inside a chamber called the root canal. The hard tissues of the tooth protect the tooth very well but a deep decay or crack can cause pain and infection in the soft tissue. An infected root canal can cause swelling that may spread to the face and the neck. In this stage the tooth is badly damaged and you should see a dentist as soon as possible. When a severe infection in a tooth requires endodontic treatment, a treatment is performed to eliminate bacteria from the infected root canal, prevent reinfection of the tooth and save the natural tooth. During the tooth examination your dentist will consider the history of the tooth and will check the X-ray images to figure out if the tooth is restorable. If the tooth requires root canal treatment, they can eliminate bacteria from the infected root canal and also prevent reinfection to save your tooth. When they find the soft tissue of the tooth to be infected or damaged. During Root Canal therapy, dentists drills the tooth to access the pulp. Then they remove the dead or infected parts from the root canal, clean the inside of the canal and finally seal it. This process can cause the structure of the tooth to become brittle and in some cases to reinforce the structure of the tooth, further treatment is required e.g. a dental crown. RCT is a repair technique that dentists use to restore a badly decayed or infected tooth in an attempt to save the tooth. RCT should be the first treatment approach, however, when the tooth is damaged in such a way that it cannot be restored with an RCT, then extraction would be the only option. For many patients, the difficult decision between RCT and extraction is when there is no certainty on the success of RCT. Imagine the spectrum of tooth damage, on one end we have a slightly-damaged pulp and on the other end of the spectrum we have a beyond-repair damaged pulp. With the slightly-damaged pulp, you can expect an RCT with a high level of success. However as you get closer to the other end of damage spectrum, the success rate of RCT can decrease. This means that you might decide to go ahead and invest in a Root Canal Therapy but due to extensive damage, the repair may fail in future and you will need to repeat the RCT and in some cases remove that whole tooth. Nevertheless, some patients decide to try to save their natural tooth with an RCT and avoid extraction as much as possible. Many dentists agree with this approach because even with today’s best dental implant technology, there is still no 100% replacement for a natural tooth. Nothing feels or functions like a natural tooth and many patients and dentists believe that it should be saved when possible. RCT when combined with a suitable restoration method e.g. dental crown, allows the tooth to be strong again and you can enjoy a variety of the food you like for a long time whereas dental implants require a higher level of maintenance. i.e. there are certain foods that you should avoid when you have a dental implant in your mouth. The RCT procedure itself is a painless dental procedure. Many patients are afraid of the RCT because they think that RCT hurts. RCT is normally done under local anaesthesia and it does not hurt at all. For patients and RCT procedure feels like changing an old filling. The only alternative treatment to RCT is Tooth extraction. Tooth extraction can also be done under local anaesthesia and therefore should be painless however between the dental procedures, tooth extraction is the most traumatic one. Most extractions proceed without any complications but there will be some level of pain after a tooth is removed. Extraction also involves the risk of dry socket. In general extraction and dental implant option tend to be more expensive than the root canal therapy combined with a suitable restoration (e.g. dental crown). The latter option tends to be a quicker treatment. Dentistry changes lives! the overall well-being of the patient is the top priority for the dentists and patients are in control of their own decision regarding their choice of dental treatment. How to Reduce the Stress of Organising a Funeral and Dealing with Family Law?